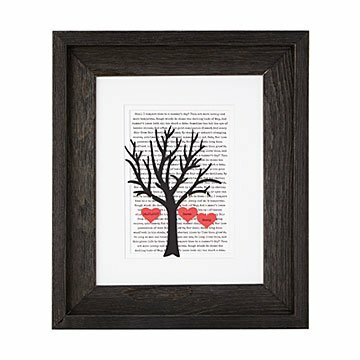 Commemorate a special date and the times you've shared with this anniversary tree art. Every love story has layers of beauty and shared experiences. Showcase the depth of your relationship with this personalized anniversary art. The three-dimensional piece includes a tree with dangling hearts that feature your names and a special date of choice. Choose between three backgrounds: a Shakespearean sonnet, the Wedding March sheet music, or a meaningful map, whether it's of the city where you married or where you first met. A great anniversary gift, you'll celebrate the life you've built and adventures you've shared so far. Handmade by Angela Rummans in California. In an lofted studio in Downtown L.A., Angela Rummans and her team make one-of-a-kind art to commemorate your special moments. But she wasn't always an artisan. Before launching her business, Angela was a professional pole vaulter. While training for the Olympics in 2011, she turned to art as a creative outlet, and decided to turn it into a full time endeavor. Since then, her company has been sending personalized designs to people around the country. "Whether it’s a first anniversary, the spot he proposed, or even the first house you bought together, you can say it with paper," she says. This unique gift was perfect! They cherish Italy and visit once a year! Very happy with my choice! I think it was a great anniversary gift! Design, quality of work, satisfaction upon receipt of order all great. The gift includes a small map of the location of wedding (or a map you choose to pinpoint an important location in a romantic relationship). The gift is further personalized with hearts inscribed with the couple's first names. It is attractive and charming and without the overly-sweet sentimentality of a greeting card. Nicely done. Perfect gift for the clueless husband! Had no clue what to get my wife for our 2nd wedding anniversary, so I came the old faithful uncommon goods! As usual they had so many unique choices, in the end very glad I went with this one. Customized just for me and seems to be of the highest quality, will be seeing what the maker of this product also has on the site in the future for sure.